York County residents have just two remaining insurer options on the exchange. Residents of York County have just two available insurers to choose from when buying plans through Obamacare. Only 10 percent of Pennsylvanians opted to buy their insurance on the federal marketplace for 2016. Highmark will not sell Highmark Select Resources or HHIC products to Yorkers on the exchange in 2017. One of Pennsylvania’s largest health insurers has confirmed it will not sell plans to Yorkers on the federal health insurance marketplace, leaving residents with just two options. 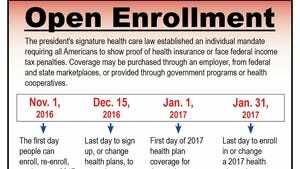 Under the health insurance marketplace set up under the president’s signature health care law, the Affordable Care Act, also known as Obamacare, private health insurers sell plans under federal or state-run exchanges. Americans must carry health insurance or face a tax penalty, but those who purchase insurance on the exchange are eligible for subsidies to offset premium costs. Highmark will not sell Highmark Select Resources or HHIC products to Yorkers on the exchange in 2017, but it will sell HHIC in other parts of the rating area and offer private insurance off the exchange, said spokesman Leilyn Perri. HHIC is a subsidiary of Highmark. The Department of Insurance released 2017 rates on Oct. 17 and included one HHIC product sold on the exchange in Rating Area 7, which includes York, Lancaster, Berks and Adams counties. However, Perri said the plan will only be offered off the marketplace to York residents. “This is an older, sicker population compared to our commercial populations,” Perri said of customers choosing marketplace plans over private, employer or government-funded insurance plans. Citing more instances of cancer, coronary artery disease and hypertension in customers who buy insurance on the federal exchange, Perri said Highmark paid $1.19 in benefits for every dollar collected in premiums. “This group of folks are more expensive to insure,” he said. Highmark is not the first insurer to pull out of the federal marketplace in Pennsylvania. Aetna and United Healthcare both made the decision to stop selling plans in Pennsylvania earlier this year, but Highmark’s withdrawal leave residents of York County with just two insurers to choose from. Only Capital Advantage Assurance Co. and Geisinger Health Plan will sell products on the exchange in York County for 2017. Six of the nine rating areas in Pennsylvania will have more than three insurers selling marketplace plans. The state’s Department of Insurance anticipated that insurers would pull out earlier this spring and approved higher rates than requested to try to keep insurers in for 2017, said Digital Director Kat Breitmayer. “When we approved these rates, we wanted to ensure that we were able to keep companies in the market and ensure the market was competitive,” Breitmayer said. However, she said, the department still expected some companies would pull out of certain markets when 2017's approved rates were announced. Only 10 percent of Pennsylvanians opted to buy their insurance on the federal marketplace for 2016, but the vast majority of those buyers were eligible for subsidies that cover a portion of the premium. A Department of Health and Human Services report released this week estimates that of returning marketplace consumers in Pennsylvania, 75 percent will pay out-of-pocket monthly premiums of less than $100 after subsidies.